Getting braces as an adult can be daunting, but keep the goal in mind – great teeth for the rest of your life! Who wouldn’t be excited about that? Don’t be afraid, let’s break it down and start your journey to having straighter teeth. Read on to learn the reasons why adults need braces, what lifestyle changes you need to factor in, and what might be the best treatment option for you. Working for straight teeth, and good oral hygiene doesn’t end as a teenager. For whatever reason, if you were unable to get braces as a child or teenager, most likely you’re a strong contender for braces as an adult. Braces are for the most part, a cosmetic procedure and not necessary unless your teeth are misaligned and causing some discomfort. The main cause for orthodontic problems is genetics. However, as we age it’s natural for teeth to shift, from gum problems, tooth decay or tooth loss. It’s not unusual to seek orthodontic treatment as an adult. You won’t regret it either. Are you ready to take the next step? Let’s learn about your treatment options. Most people find the traditional metal braces unappealing -especially adults! Don’t worry, new technology has got your back – and we’ve got a couple of different treatment options to get your teeth straighter. Before you have a traumatic flashback to highschool chunky metal braces and headgear – this won’t be your reality, we promise! Technology has evolved, and can now save you from social embarrassment. Modern braces are subtle, smaller and more comfortable than ever before! They also now come in discreet white, or transparent colours. Although Invisalign is even more discreet, braces are still the best way to achieve results in a short period of time. Lingual braces are both effective, and discreet. Lingual braces fit to the back of teeth instead of the front, providing the wearer with comfort and effective results . The effect of lingual braces is similar to traditional braces, however they’re difficult to fit and are the most expensive choice compared to regular braces and Invisalign. Lingual braces are a great choice for people concerned about discretion, fast results and don’t mind splashing a bit more cash! 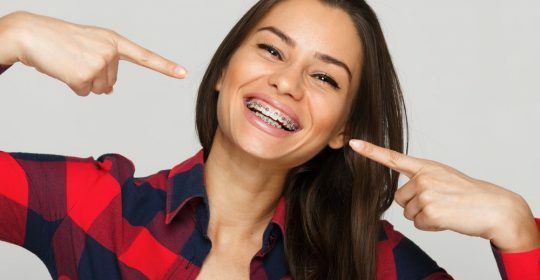 Not everything in life is enjoyable – and unfortunately the journey of having braces can be a bit uncomfortable. Much like making your bed, it’s a drag but it feels so good jumping into a made bed after a long day. Approach your teeth in the same way. The journey is challenging, but the results are priceless! Remember: what’s a year or two when you’ve got straight, healthy teeth for the rest of your life? Karalee Family Dental is a trusted local practice located near Collingwood Park. If you have any questions regarding orthodontics or options for braces, don’t hesitate to contact us today.